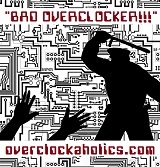 Overclockaholics Forums » Welcome to Overclockaholics » Suggestions » How do you guys keep track of stuff? Seems like you might be over thinking things a bit bro. so i am saving it and rebench it ALL one day. Then I go under my submissions, say i wanna check how high i went with "one GTX 580" in 3Dmark 05 I then click on "Videocad" ope tne scroll down to 05 boom all my submissions are there, well all my best at least. You can also do that with CPU/motherboard/memory too and 2D tests as well. Socket A AMD I have them all filed and on hand. of course i monna bench the ones no one benched before to get some TPP and bench the others when i get some time.